I think I was talking about unconventional lipstick brands with fellow blogger Arabelle when she mentioned the brand Portland Black Lipstick Company. I had never heard about them before so I did lots of googling and came across this impressive swatch post by Good Morning Angel. I contacted them about trying a few of their lipsticks out and was sent a whole bunch of samples so I'm splitting this up into two posts so as to not overwhelm you with swatches! I'm trying out a better way of writing my reviews by adding in a pros/cons section so do tell me if you find it useful or not and I changed the way I have my lip swatches by showing my bare lips for each color. Do tell me if you like either change! Be sure to check out Part Two with the other half of the lipstick swatches when you're done! These lipsticks are packaged in round lip balm tubes and shrink wrapped. Personally I don't care for shrink wrap but I appreciate the touch. I think the branding for the lipsticks is well done, and it certainly adds a professional touch. The lipsticks aren't vegan since they contain beeswax, lanolin, and carmine for some colors but I did notice that they are working on a vegan lipstick base. I would like more specific ingredient lists for each color, showing which have and don't have carmine. Swatches ahead! These were taken in natural daylight with no flash. With the exception of Black(which I applied from the tube), I applied the lipsticks using my finger.The colors are opaque enough that a thin layer gives great coverage. The lipsticks are fairly soft so applying from the tube means you get a heavier and thicker layer of lipstick, running the risk of getting lipstick on your teeth and it can be difficult to get a precise edge. 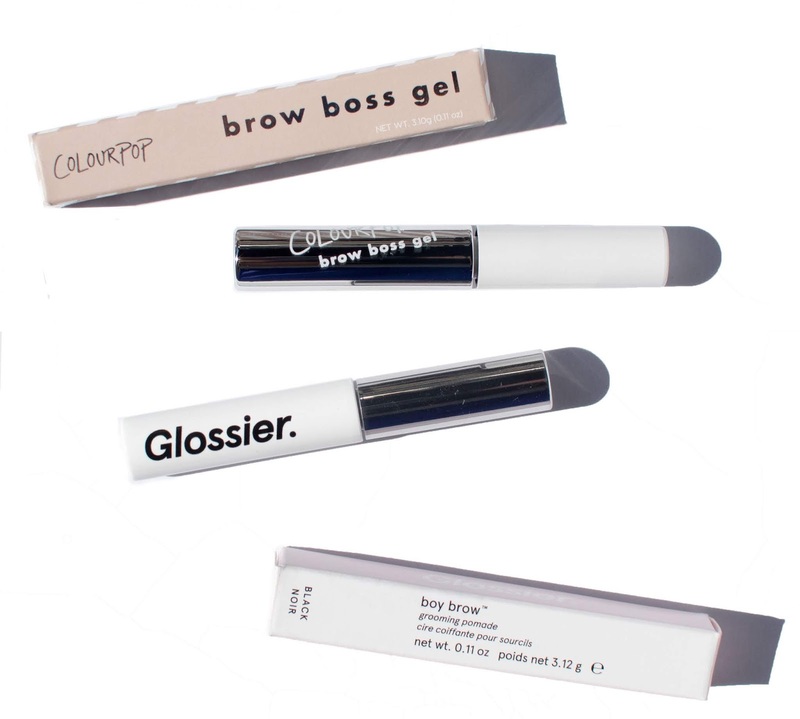 The formula is soft enough that you can apply with your fingers or a flat lip brush but if you apply from the tube, I would recommend blotting or doing the "Finger Pop" to get the excess off. Wear time on these lipsticks were great. I wore them for about 4 hours (not eating and drinking) before I removed it and nearly all the color was still on so you can easily get hours more of wear time. I want to apologize for some of the dust on the bags, it's not in the bag but just on the exterior. Artificial Amethyst: "We introduced this dark purple lipstick at this year's wonderfully fun Portland Hallowe'en. In true modernist fashion, we celebrate the fact that it is not made from real gemstones but from FDA approved mineral pigments". This is a black based purple and while not my favorite, I do love the royal purple sheen to it. Bad Penny: "Strong copper color that combines metallic shine with good coverage". I love this color like no other. It's as if I dipped my lips into molten copper penny. The coverage on this is amazing and though I don't normally favor metallic lips, this is a must have. This was one of the softer lipsticks and a dream to apply. Black: "The best ever! A perfect blend of black iron oxide and mica in a moisturizing base, this color is opaque and long-lasting" This is an extremely opaque shiny black lipstick, similar to the finish of patent leather. Though many brands will claim one stroke opacity, this delivered it. If you're not one for a glossy looking finish, you can blot with a tissue and it'll take away the shine. Blood Red: "Developed by accident, this color is disturbingly realistic". I wouldn't necessarily call this a pretty color, especially since one could conjure up a number of unpleasant associations but I'd say it's spot on and very opaque. Bug's Blood: "A charmingly simple cold red stain made from carmine. Good for Neo-Victorians". This lipstick looks deceptively dark but when you put it on, it's a bright raspberry pink. I don't consider it a stain in the sense that it doesn't color your lips and is easily removed without leaving color behind. 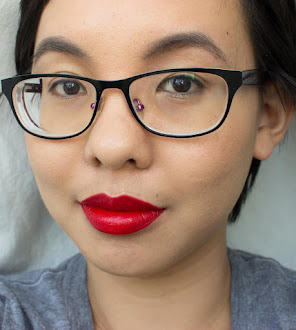 It's a very buildable lipstick and one of my favorites from the batch. Sorry, I couldn't take a color accurate lip swatch so this was the next closest thing! Chlorosis: "Have you tried to get diagnosed with the Green Sickness lately? It's nearly impossible! Thankfully, we offer this green shade for lips (or face, as needed)". This was one of the shades (along with the next one, Difficult Island) did have unblended ingredients in the lipstick and I'm hoping that'll get fixed. This one could get opaque but it was slightly patchy on. Difficult Island: "What does every oceanic adventure need? A difficult island! Difficult Island lipstick is a beautiful and vivid aquamarine blue. For those of you familiar with our lipstick palette, this color is a little greener than Cyanosis but much bluer than Chlorosis" I had to adjust the coloring in the picture to get it more true to real life. This also had an issue with unblended ingredients but it smoothed out on my lips. These have damn near opaque coverage. I really do like these lipsticks, even though I'm not too fond of the packaging. It can be difficult to find unconventional colors so I'm glad to have come across a brand that caters to that market while still having conventional colors available. Stay tuned for my Here's part two where I cover the other seven lipsticks I got! Are you intrigued by any of the lipsticks? I love Bad Penny & Blood Red on you! Difficult Island and Black look awesome - I adore weird lipstick shades! I was immediately drawn to Bug's Blood. It would be my #1 pick! Artificial Amethyst and Black are amazing. And Blood Red? I love shades like that. They make me think of the 90s in terms of what colors were worn quite a lot... it's one of my favorite shades!! Thank you for this, Im going to their site now! I really like the purple and blue shades. *dies* Holy balls, I want all of these. LOOK AT BLACK. Oh my days. Bad Penny is amazing as well. Le sigh. And I like seeing the bare lips next to each colour, it really helps give an idea of coverage and texture. Also you sure do got a purty mouth. :) thanks for linking me! Your swatches look awesome - really professional. These look great so far I really really can't wait for the rest of the lipstick swatches! Oh my that black is to die for. Wow, I really really need to get some of these! Bad Penny, Bugs Blood, Black and chlorosis are just amazing! Artificial Amethyst and Bug's Blood - yes! Their Etsy store has pictures of women wearing them, including the owner herself :). Some shades have comparison swatches.